Three towers are slated to rise on the Two Bridges waterfront. LOWER EAST SIDE — The city's process for reviewing three massive residential developments slated to rise on the Two Bridges waterfront is not only lax, but unlawful, argue housing lawyers working on behalf of concerned neighborhood groups, who are threatening to sue over the issue. The Department of City Planning's former director Carl Weisbrod one year ago rejected the pleas of elected officials and community members to put the cluster of mega-towers through the Uniform Land Review Procedure (ULURP) — the city's most strenuous review process for new developments — instead determining the projects constitute mere "minor modifications" that don't need any permits or waivers. But that determination runs contrary to the city's zoning text, attorneys of the Urban Justice Center's Community Development Project say. The proposed developments fall in an area known as a Large-Scale Residential Development (LSRD), which comes with its own set of rules — new developments must either be authorized by the City Planning Commission or get a special permit, which requires the ULURP process, the attorneys argue. "Every time something has been added to the LSRD, it has been specifically permitted," explained staff attorney Paula Segal. "[A minor modification] is a completely different rule for a different context...it is completely illegal and bizarre that director Weisbrod thought he could stick it here and get way with it." Segal co-signed a letter along with two other staff attorneys, Melissa Risser and Adrien Weibgen, to current DCP director Marisa Lago calling on the commission to subject the towers to what they say would be the legal process that comports with the LSRD rules. If DCP refuses, the letter states, the attorneys will file a lawsuit against the agency claiming its determination was "arbitrary and capricious," said Segal. Large-Scale Residential Development areas were created in the 1960s in order to allow air-rights transfers that facilitated large, dense projects in areas that would otherwise be restricted to smaller homes, according to DCP documents, giving way to more efficient community planning. The existence of an LSRD allows for the precise planning of a certain swathe of land's use, explained Segal. "What the LSRD is, is a very precise and complicated air right transfer mechanism that allows a whole neighborhood to to be planned and to have the massing controlled at the level of the neighborhood," she said. So adding buildings to an LSRD is supposed to be an appropriately precise process, she continued — new developments must be authorized or permitted. Three developers are currently planning three developments within a three-block radius that will altogether bring an estimated 2,682 new housing units to the neighborhood. 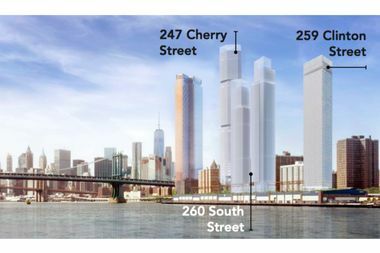 JDS Development Group plans to build a 77-story tower at 247 Cherry St., while Two Bridges Associates plans two towers on a shared base at 260 South St. Starrett Development is planning a 62-story residence at 259 Clinton St.
Community members have repeatedly declared their opposition to the trio of towers expected to rise in their backyards, fearing they will lead to overcrowding, lack of sunlight and open space, and that the area's infrastructure and schools can't handle the additional numbers. The Urban Justice Center is working on behalf of a handful of neighborhood groups that share these quality-of-life concerns — Good Old Lower East Side, Tenants United Fighting for the Lower East Side, and Lands End One Tenants Association. The developments are currently undergoing the city's mandated environmental review process, wherein the agency will identify potential impacts on the surrounding environment and ways to mitigate those impacts. “The City must follow the law. While the modifications sought for the Two Bridges sites do not trigger ULURP—in other words no new density or waivers are needed—a thorough environmental review which offers multiple opportunities for the public and elected officials to participate is being conducted," said DCP spokesman Joe Marvili in an email.